We have inert det cord again. 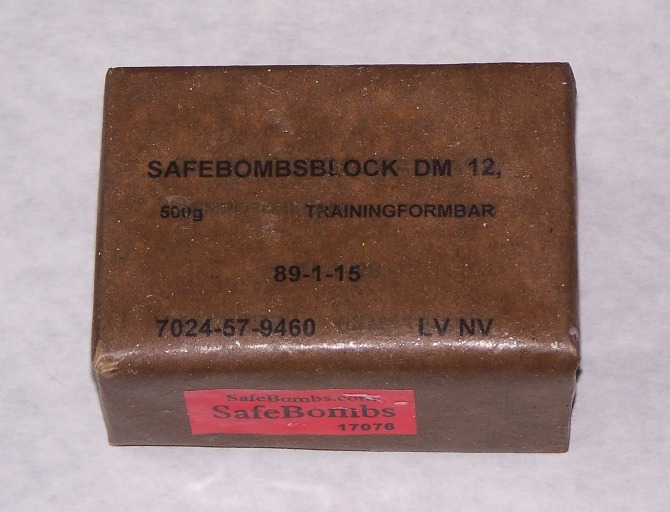 SafeBombs, LLC is owned by Veteran Larry Johnson and Susan Johnson. We are the builder, buyer, secretary, accountant, packaging, shipping, inspection, complaints & web master. SafeBombs, LLC is a family run business. 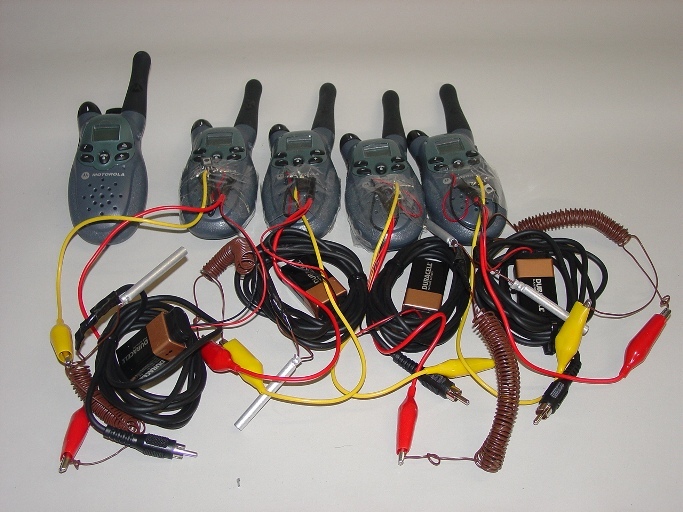 We provide training aids for bomb squads. Our devices are monitored with an electrical connection to determine if the procedure to safe the device was quick enough to defeat the circuit. If you are U.S. military there won't be any security paper work to fill out. All others will need to fill out a form before we ship. We reserve the right to limit sales to anyone. We do provide training devices to organizations with a valid need but if you aren’t a Bomb Squad the electric timers will be replaced with a timer that is not capable of firing a blasting cap. If you spend over $2500 and pay within 30 days we will give a $100 discount. For example if your credit card order is $2501 the discount is figured automatically so you would only be charged $2401. In most cases there won’t be tax and standard shipping is included in the price. You will pay for the shipping if overseas and not to an APO / FPO or if you need it shipped overnight. If the order is on a contract the discount will be available only if the bill is paid within 30 days. If we get paid on time we will send a note to the shipping address asking what items they would like to spend their credit on. Terms: Net 30 days. 1% per month there after. We want you to be trained. If you have a device by SafeBombs, LLC or by Sparta ETS, There is a good chance we designed or built it. Contact us if you need parts, directions or just want to know what it is. If you need an exact model or style please let us know when ordering an item. 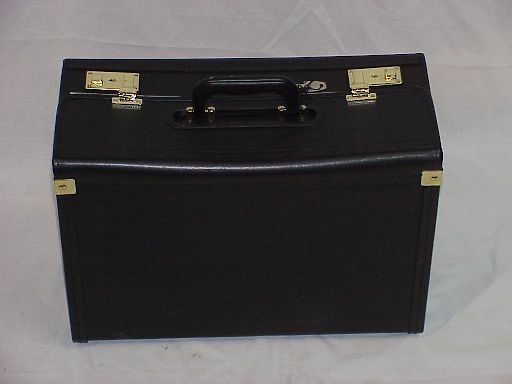 If your team has seen our items and you want the same box but a different trigger just ask. We can modify existing devices or custom build them to your specifications, contact us with your requirements. The information provided below is limited so that exercises and evaluations are not compromised. The Device Manual provides detailed information on design, simulated components, and firing circuits. This information can be released to Training Managers upon request. Description: Kit contains 10 ea. Inert caps. 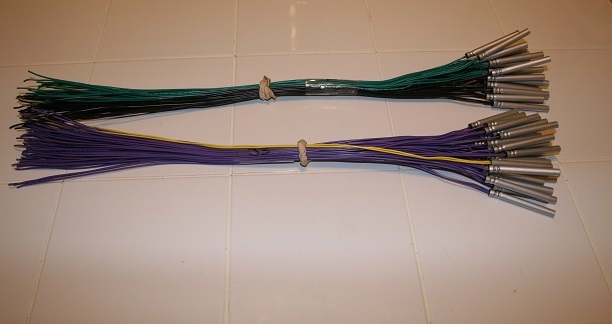 Military style caps (6' brown leads). Normally closed but you can request normally open. Description: Kit contains 10 ea. Inert caps. Civilian style caps (6' multi colored leads). Description: Kit contains 20 ea. Inert caps. Open on both ends (tube) no flair. 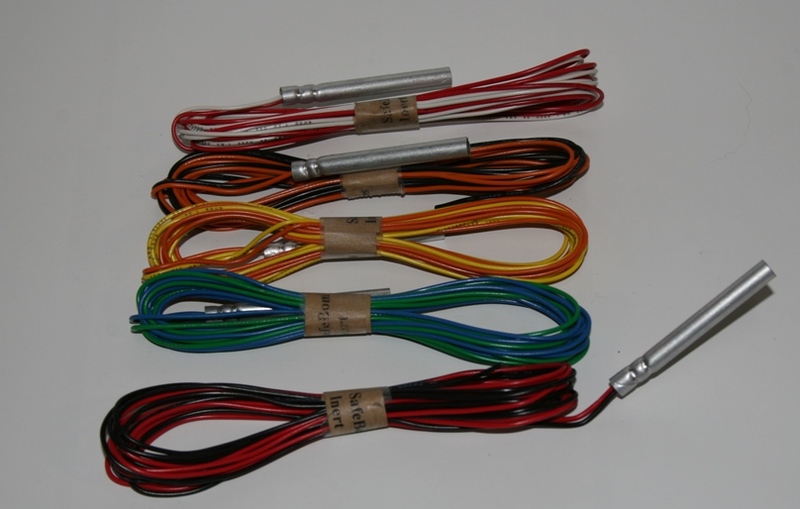 The caps are used in conjunction with inert time fuse (SafeBombs currently does not sell inert time fuse). Description: Kit contains 250 ea. Inert caps. Open on both ends (tube) no flair. 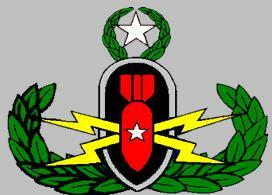 The caps are used in conjunction with inert time fuse (SafeBombs currently does not sell inert time fuse). Save $59.00 compared to purchasing individual items. 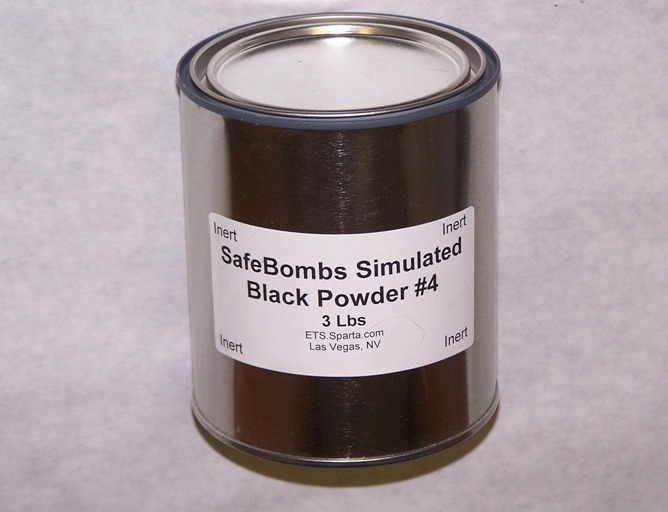 Description: Realistic, yet completely hazard free inert explosives simulate live explosives. They DO NOT carry a scent, therefore, should not be used to train canine teams. 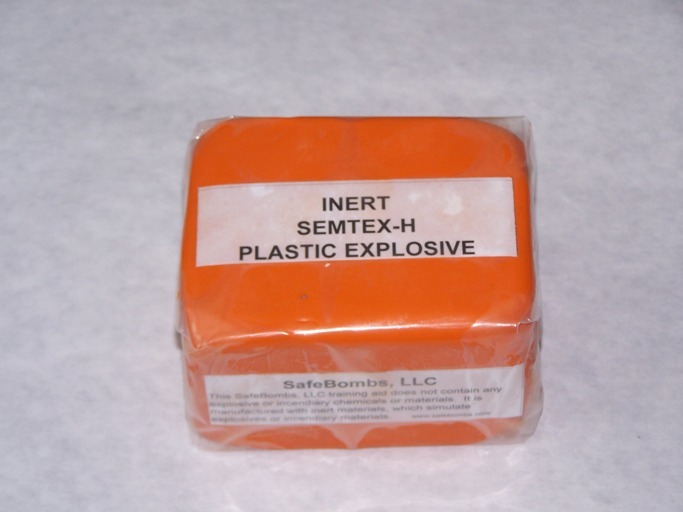 Kit consists of 10 blocks of inert C-4, 8 sticks of inert dynamite, 2 blocks of inert SEMTEX, 2 blocks of inert DM-12, 20 inert electric blasting caps, and 40 inert non-electric blasting caps. 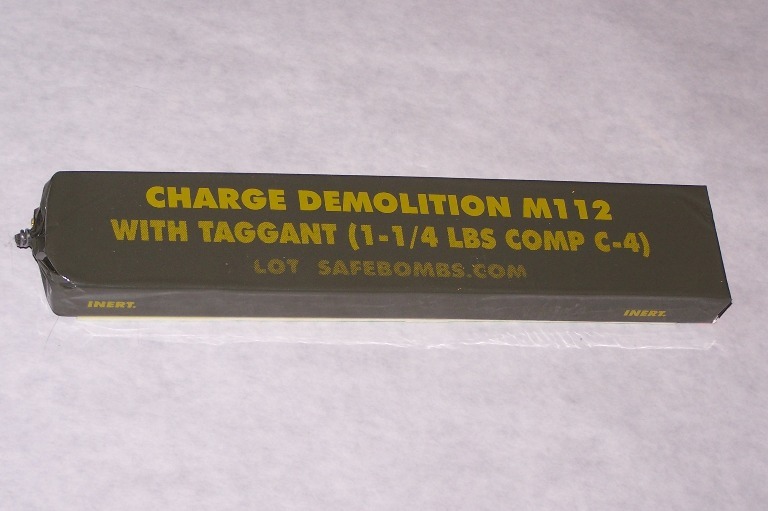 Description: Replica of a standard M-112 C-4 demolition charge. 1.25 pounds in weight. Filler is oil based clay to give realistic weight and making it moldable. One end is crimped and the bottom has realistic doubled sided tape. Does not contain wood or Styrofoam filled blocks or fake double sided tape on the bottom. 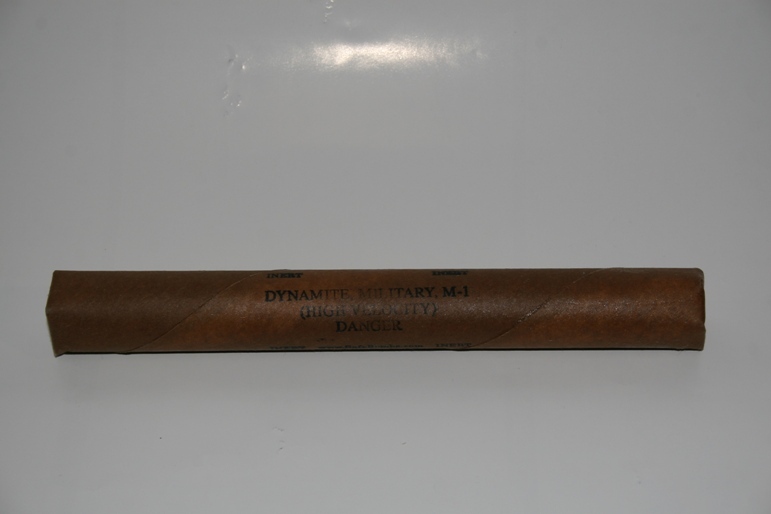 Description: Replica of M-1 military style dynamite. 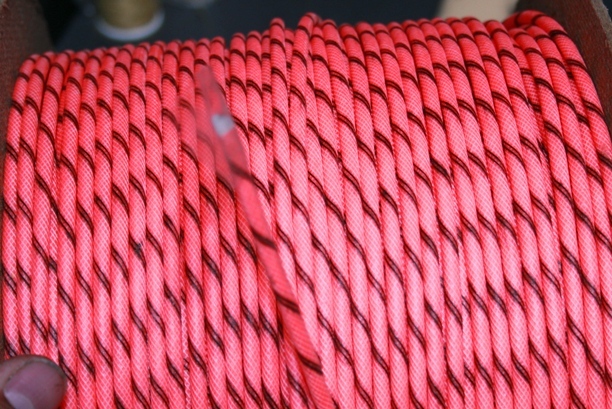 Description: Orange and black Cloth cords wrapped around a core of inert white powder from an explosive manufacture. 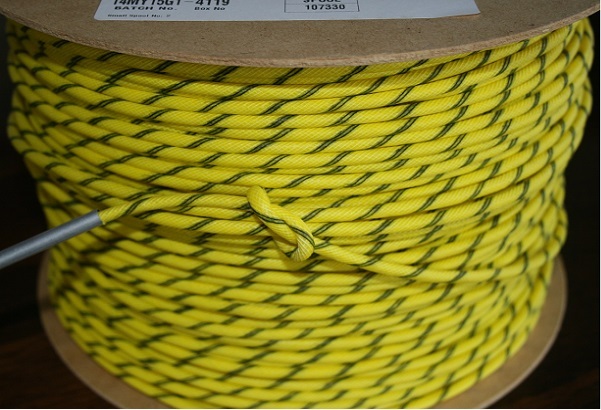 Description: Yellow and black Cloth cords wrapped around a core of inert white powder from an explosive manufacture. 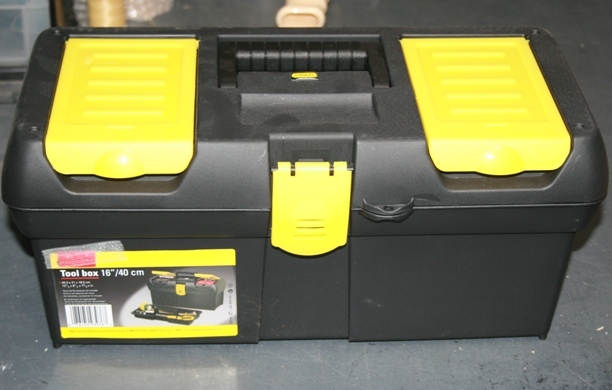 Description: Plastic tool box with simulated explosive and a timer Item may be modified for anti lift, anti open etc. Circuitry level is basic. 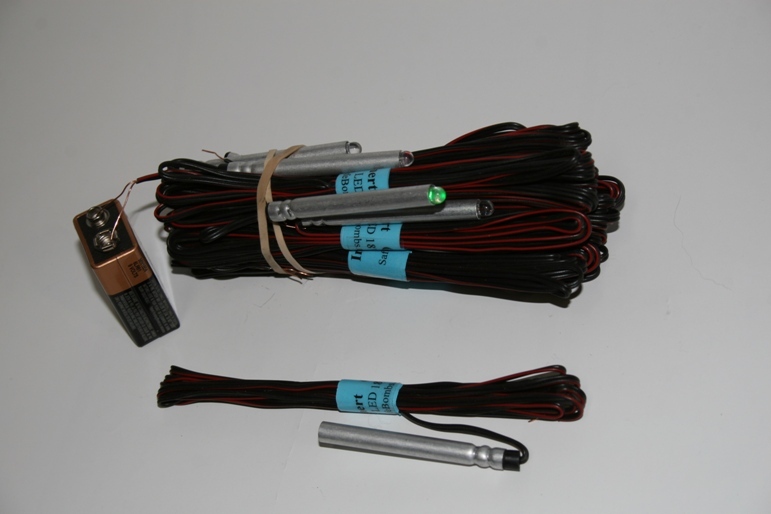 Description: Active Inferred beam and detector. Outdoor range 200 feet. Spend more than $2500 and we will take $100 off the price if paid within 30 days. Credit card orders will have the $100 deducted before we run the card. Explosive kit #62 is already discounted and won't be double discounted. 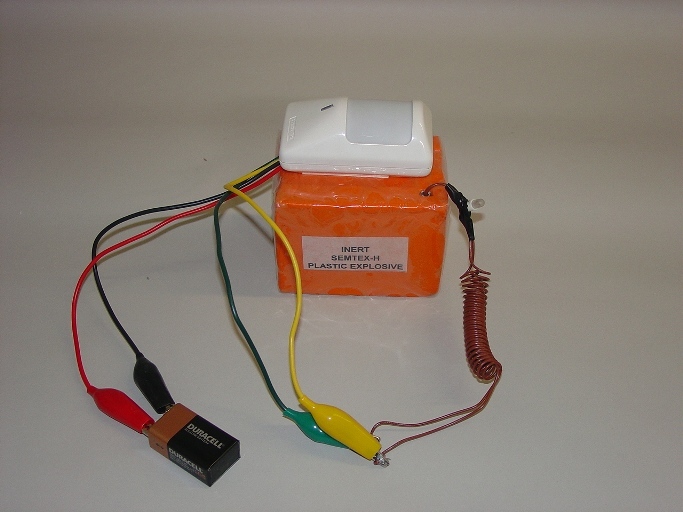 Description: The SafeBombs device monitor is used to track the functioning of devices we manufacture. 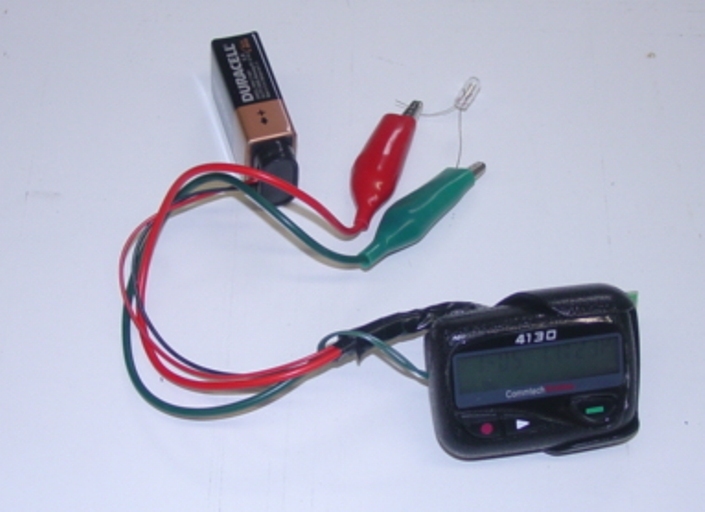 SafeBombs device monitors will display a locked signal to indicate the device functioned when time expired or the render safe technique was unsuccessful. The kit comes complete with 2 monitor boxes and 10 feet of wire used to extend the monitor away from the device during evaluations. 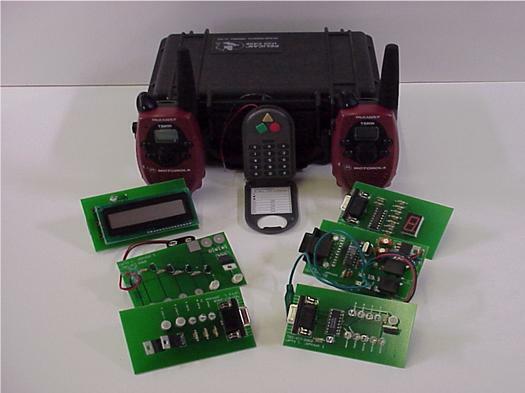 Description: This is a set of six circuit boards the first decodes DTMF tones. These are the tones that tell your telephone which number is pressed. The next four boards displays the tone by weighted output (1,2,4,8) or one of ten (0,1,2,3,4,5,6,7,8,9) or seven segment 8 is displayed as an 8 and the forth uses a PIC circuit to display the information on an LCD display. You can enter a fire code and the next time it sees the same code it will turn on a LED. A clear code can be sent to turn the LED off. The last circuit board shows how the small current passing through you fingers can turn on a light when amplified with transistors or one FET. 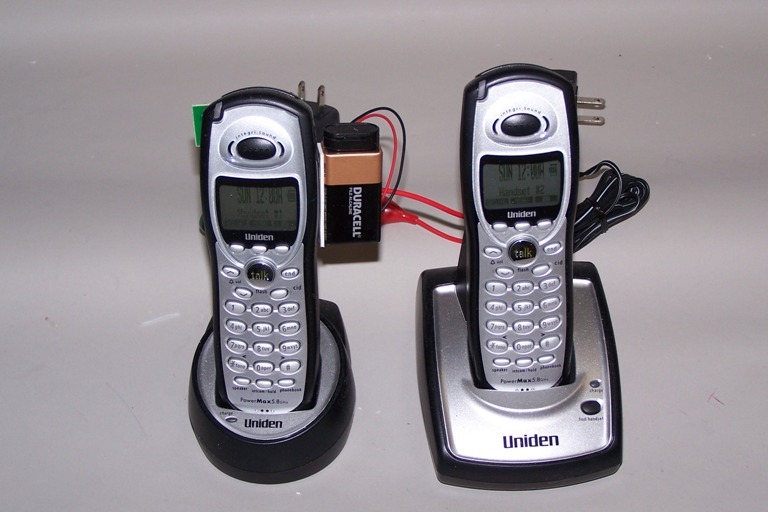 The kit also comes with a DTMF toner box to generate the tone, a set of family radios to show the tone can be transmitted, Hookups are provided to connect to several styles of cell phones. Circuitry level is advanced. Description: This device is similar to the kitchen timer. This device does not come with a pager transmitter and probably can not be activated with local service. It fires when the alarm goes off. 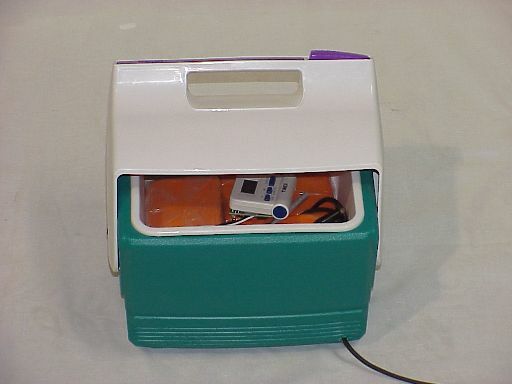 Description: The device is setup and at the completion of the safe separation time it senses movement of body heat to set off simulated charge. Circuit intermediate. 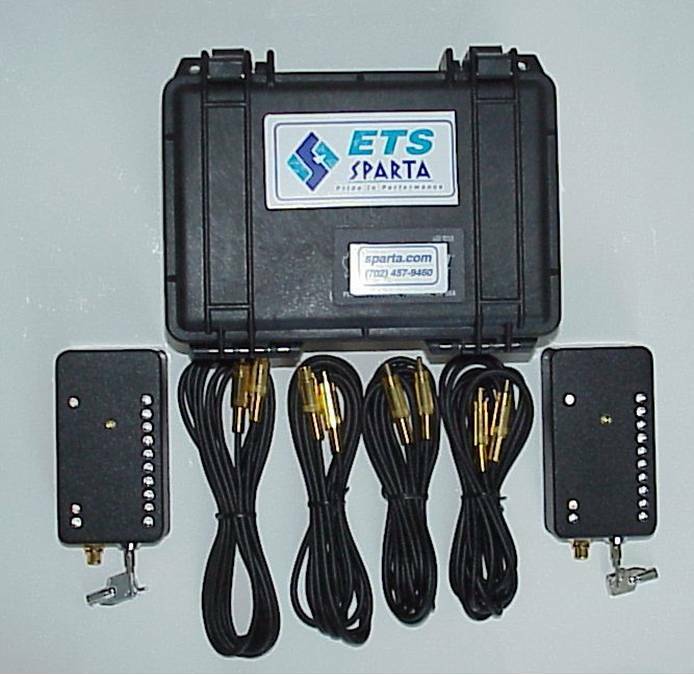 Description: This device comes with one transmitting radio and 4 receivers. The receivers are looking for any noise on the air. Description: This can be fired by plugging into an active phone line and calling or the second hand unit or base can be used to page the first hand set. 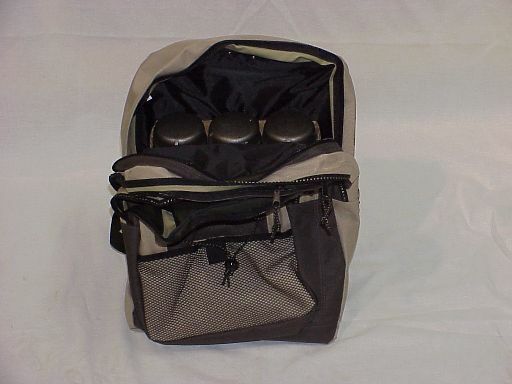 Description: The backpack device is designed similar to item 10 but has a wire that goes around the hostage to prevent its removal. Device functions by time and anti removal. Circuitry level is basic. 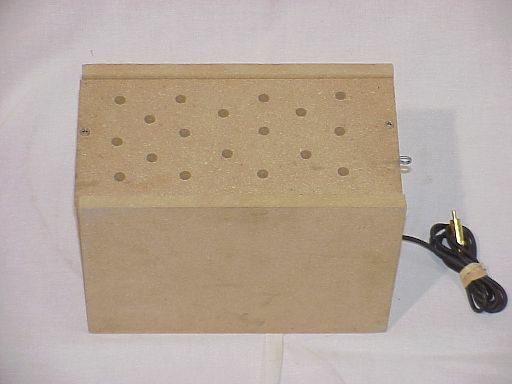 Description: This device is housed in a catalog case and is timer operated with a simple victim operated switch using conventional explosives. Circuitry level is basic. 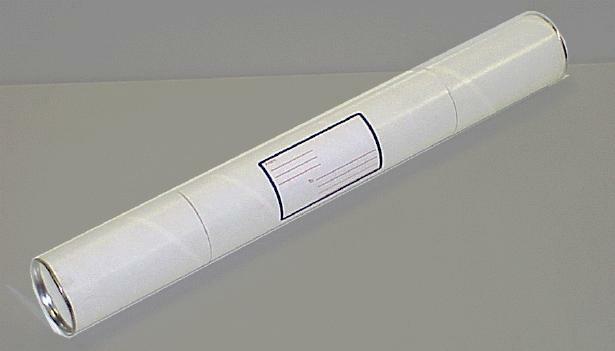 Description: The mail tube device is a victim operated device concealed in a parcel tube used to mail maps and other large documents. 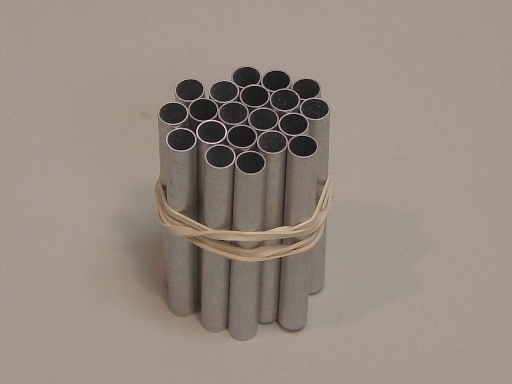 A PVC pipe houses conventional explosives inside the tube. Circuitry level is basic. Description: The backpack device is designed similar to the device used in the Centennial Park bombing during the Atlanta Olympic games in 1996. Device functions by time. Circuitry level is basic. 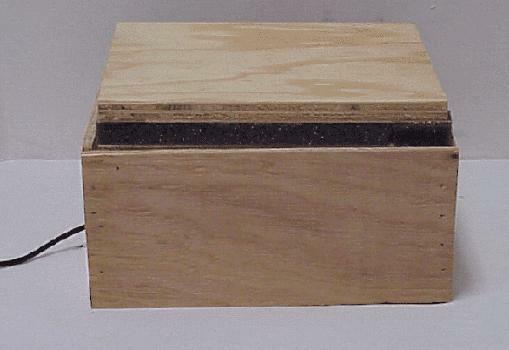 Description: The IED box mine is an improvised antipersonnel landmine constructed in a wooden frame. Device utilizes simulated conventional explosives for a main charge. 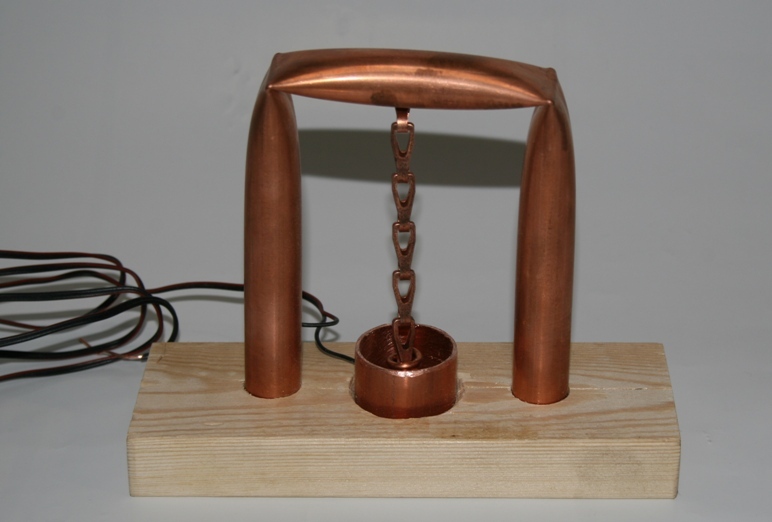 Fuzing is pressure and anti-tamper. Circuitry level is basic. 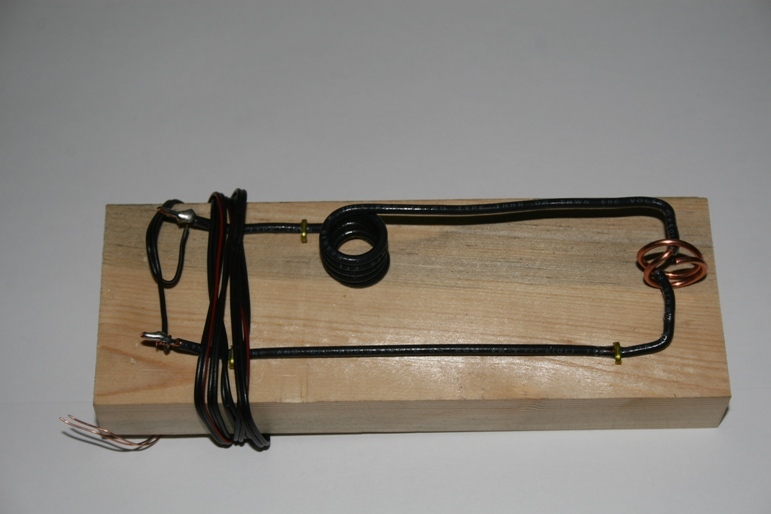 Description: The anti-vehicle tilt-rod landmine device is constructed in a wooden box. Its purpose is to sit near a vehicle. 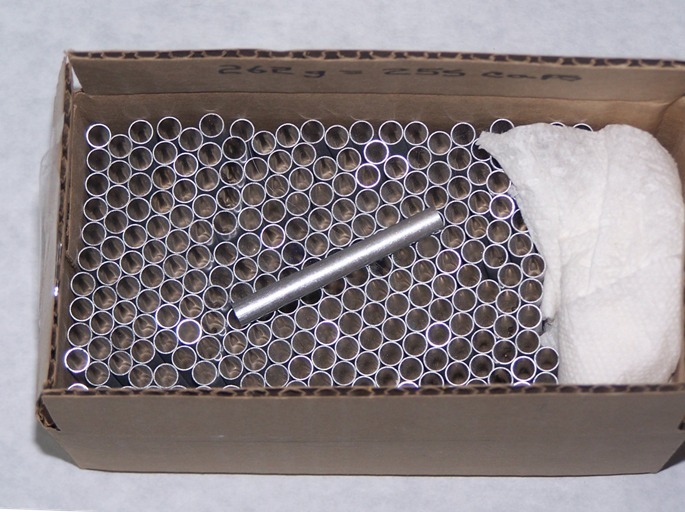 A thin metal rod protrudes from the device to make contact with vehicle parts. 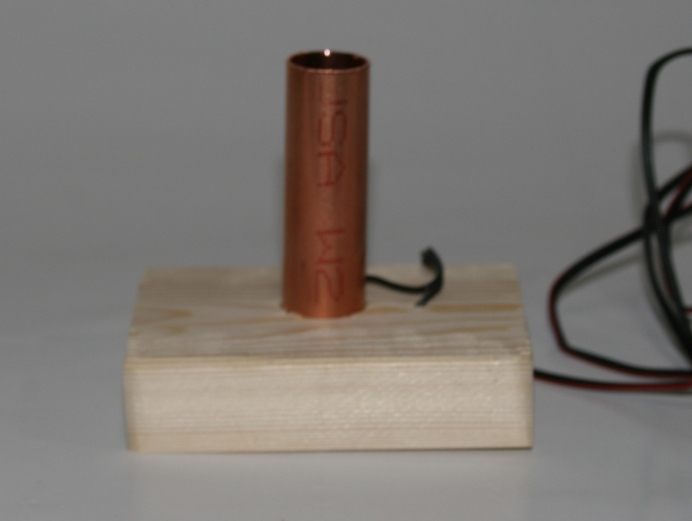 Device contains a large amount of simulated conventional explosives as a main charge. 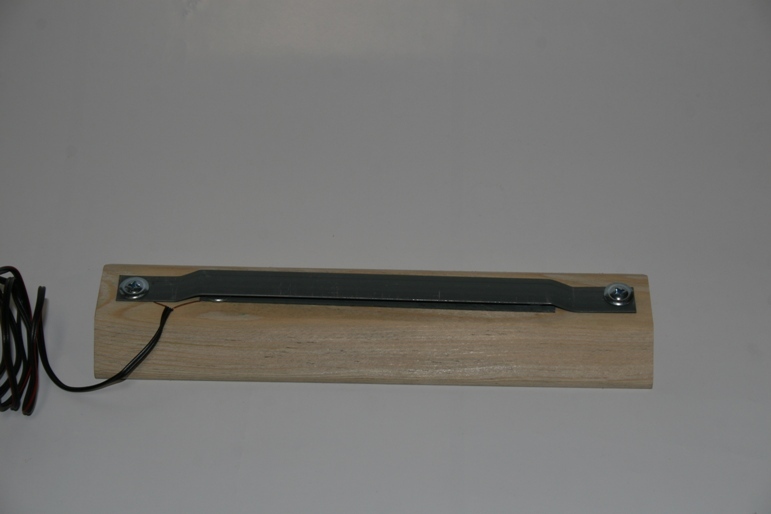 This device uses the hardwired monitor systems. Circuitry level is basic. Description: The 6-pack cooler houses 3 blocks of simulated SEMTEX inside the cooler. Functioning is unique, a great diagnostic problem. Call for additional details. Circuitry level is intermediate to advanced. 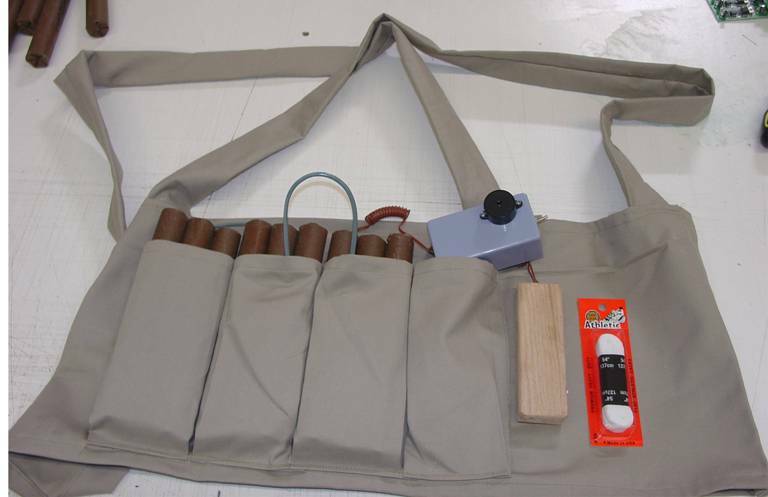 Description: This suicide vest is designed to closely replicate current suicide vests used in Middle-East attacks. 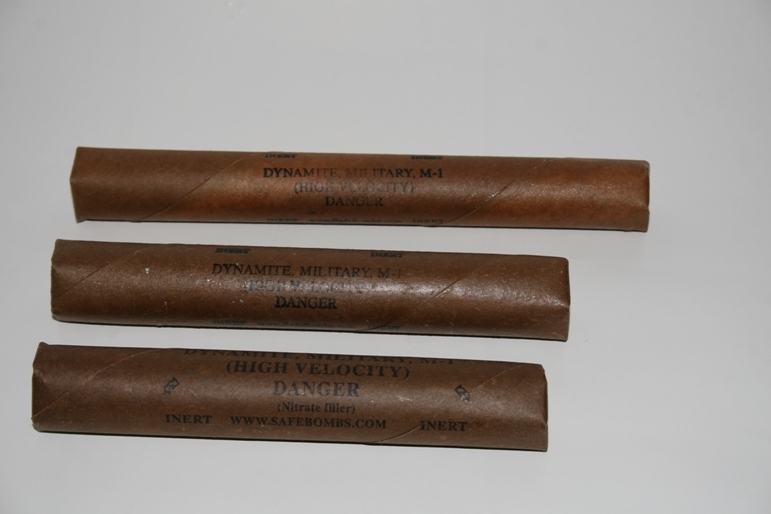 Simulated main charge is dynamite. Circuitry level is basic. 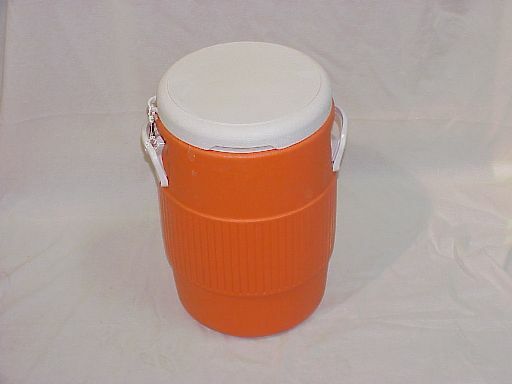 Description: The Orange Jug # 1 device is housed in a common 5 gal water cooler. Functioning is by a timer power unit and a victim operated back-up using 20 sticks of simulated dynamite. Circuitry level is intermediate. 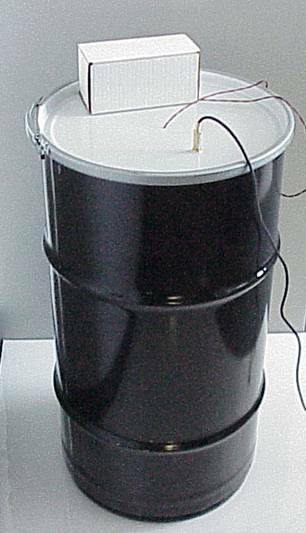 Description: The 16 Gallon Drum Device is a metal storage drum with a mechanical clamp band sealing the lid. 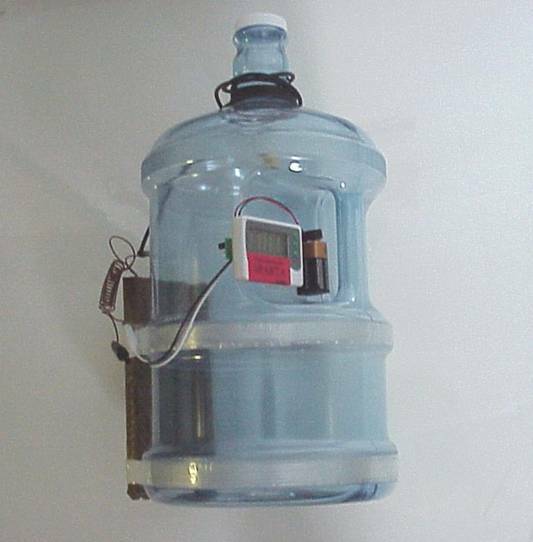 The device comes with a booster pipe bomb, filled with simulated plastic explosives, in a free-floating configuration. A separate Time Power Unit (TPU) with wire is included and runs to the front of the vehicle. Anti-tamper switching is included. The device does not include filler which simulates the main charge. Circuitry level is intermediate. 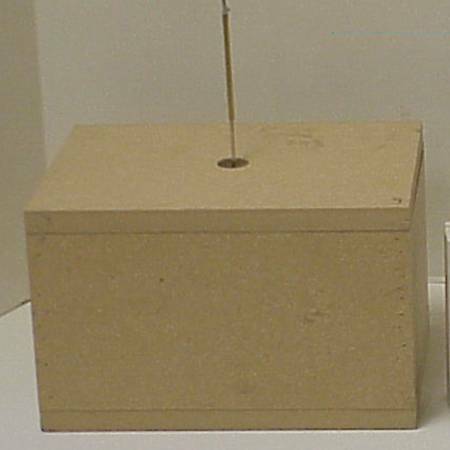 Description: The chemical breaking device is constructed in a wooden box. 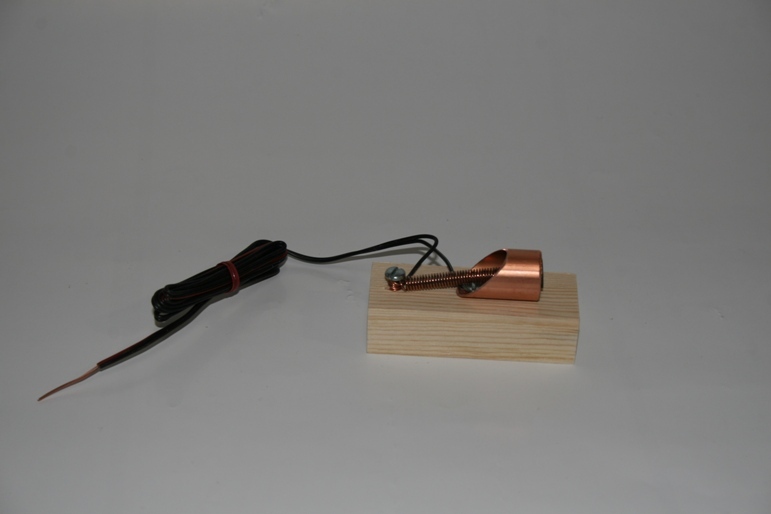 The device is designed to release a simulated chemical or biological agent without the use of explosives. Fuzing is both time and anti-tamper. Circuitry level is intermediate. Description: Approximately 3 gallons of simulated chemical agent is contained in a sealed water container. Simulated dynamite is used to disperse the simulated agent. Device functions by time. Circuitry level is intermediate. 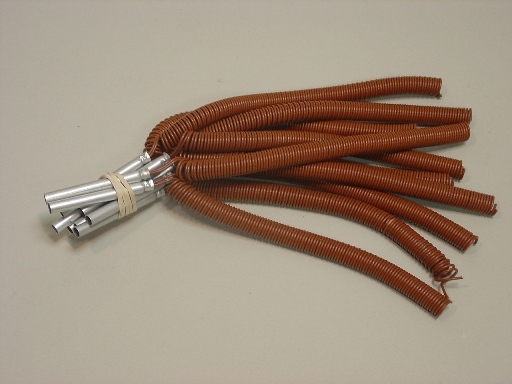 Description: The biological dispersal device disperses a simulated biological agent through a small vacuum system. Primary functioning is by time, and a secondary victim operated function is connected to conventional explosives. Circuitry level is intermediate. 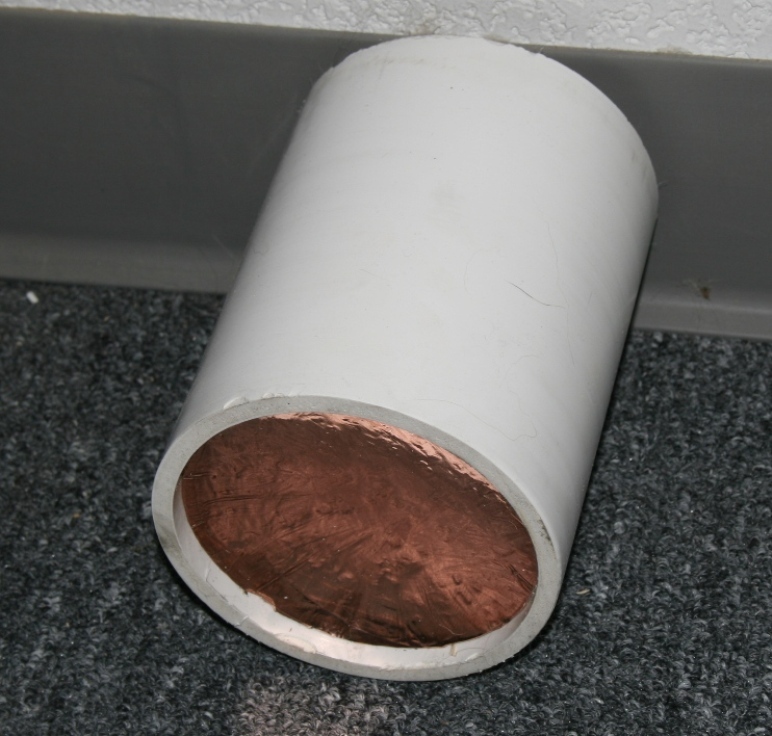 Description: 4 inch pvc pipe with a copper coated dome fastened into the end. Timers will be sold to EOD and Bomb Squads. Timer that sense light can be switched between dark being safe or light being safe. Sensors that see a switch, like vibration have a lock on circuit. When the contact touch the buzzer goes off. Having the sensor sit in the open condition for two seconds and then making the contact touch again will turn the buzzer off. 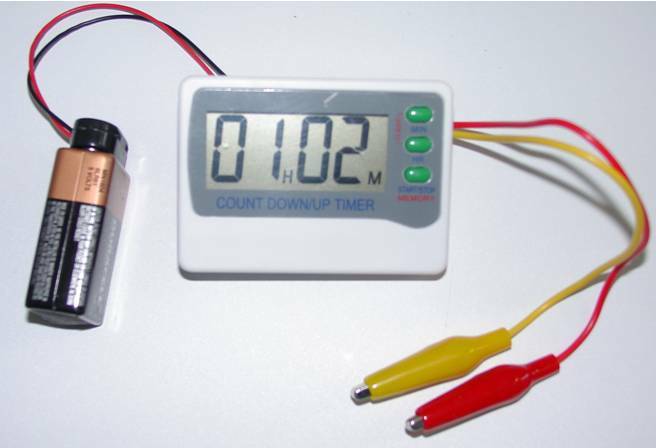 Description: Electronic components amplify the output signal from the timer to the full power capacity of a 9-Volt battery. Circuitry level is advanced. 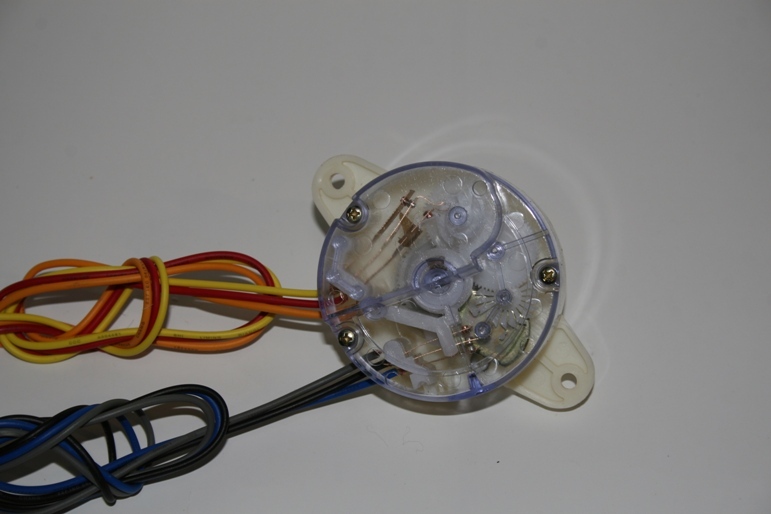 Description: Wind up timer has 6 wires and 4 contacts Contact one only closes during the last 20 seconds then opens at the very end. Contact 2 closes when the timer is running and is open at the end. Contacts 3 and 4 switch between 3 closed 25 seconds, all open 5 seconds, 4 closed 25 seconds, all open 5 seconds and repeats. Switches don't come with any books, x-rays etc. 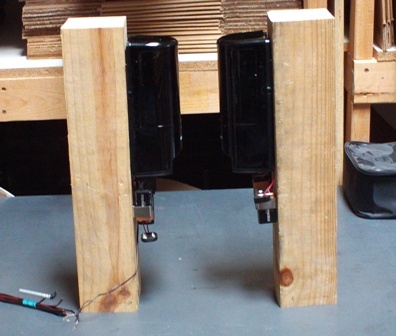 They come with wires to hook up to your circuit. 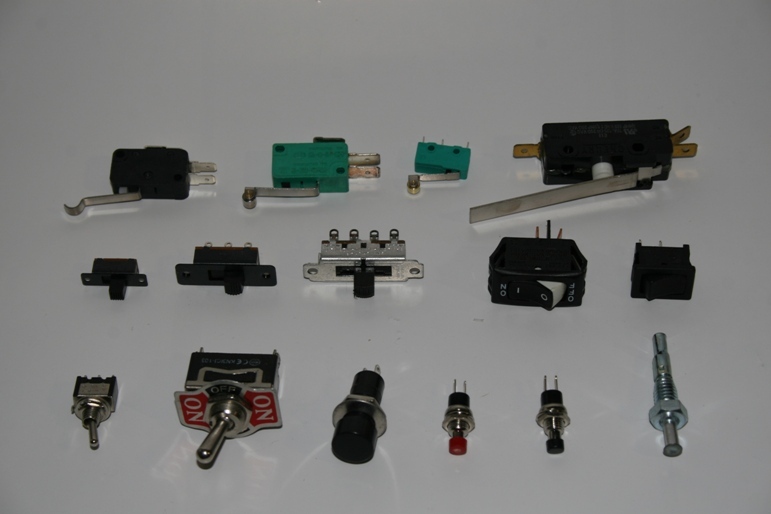 Description: 15 switches with terminals large enough to solder to. 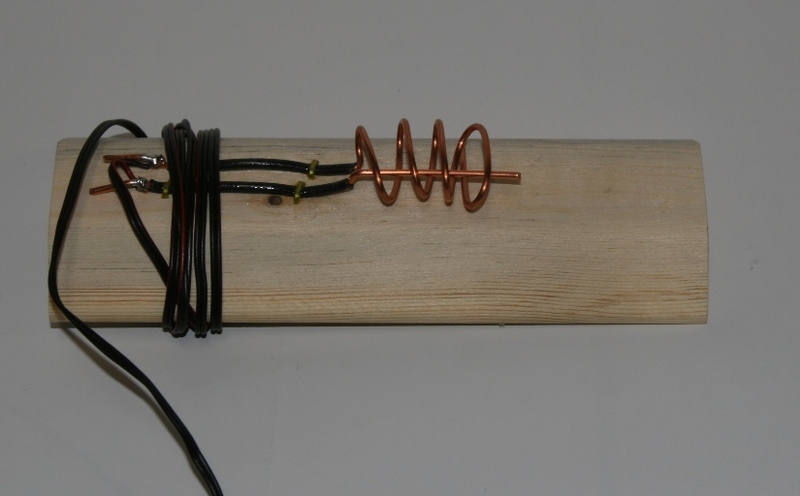 Description: Spring mounted on wooden base makes contact when vibrated with hookup wires. Circuitry level is basic. Description: Contact switch with hookup wires. Circuitry level is basic. 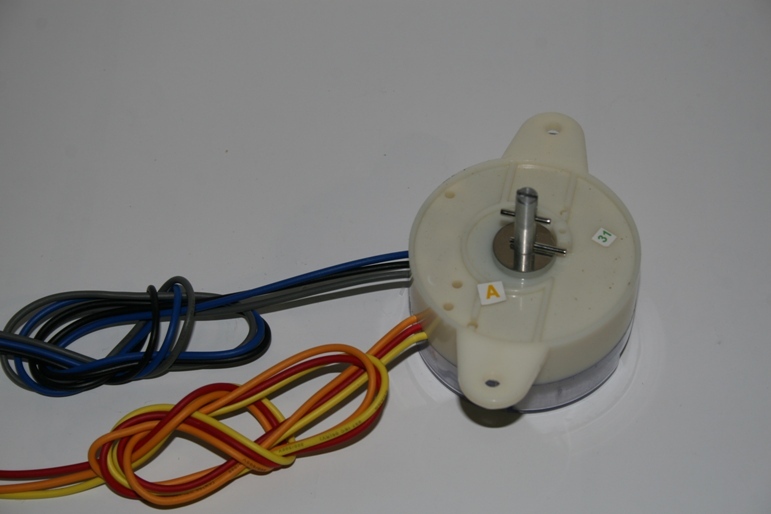 Description: Contact switch with hookup wires. Standard will be with spring closing the loop. In this position it can be used as tension release or pressure release. We can ship it with the spring holding the contacts open for pull or push fired. Circuitry level is basic.